We awoke to a fairly heavy cloud deck and I really didn't have very high hopes that we'd get the heating we'd need to get anything but rain storms. The moisture was clearly already there, being in the 70 dewpoints when we awoke. Well, I was wrong about the potential as the area was T-boxed almost as soon as we left Pierre. With the entire plains seemingly engulfed in squall lines, it was a day to try and find an embedded supercell in the line. Well, we found one pretty quickly once we got to I-90, and headed west to Murdo, SD, then south on 83 to White City, where a cell was brewing up just off to the east. As we waited while Roger went cruising off into the hail core trying to harvest some baseballs for his Boeing contract, the storm really got it's act together and soon produced a well pronounced lowering with obvious cascading motion. As the RFD came around and eroded the back side of the updraft, the storm crossed the road near us and headed north into a road hole. Taking a farmer's word for it that the dirt road we were on was a mud pit farther up the road, we had to go about 5 miles back east to White City then all the way back up to I-90 to get back in front of the storm, which was heading due north at about 20 MPH. Once we got out to 83 we really got a good look at the overall structure of the storm, and it was a true supercell: rock hard updraft and vault region, large beaver tail at mid-level, and solid wall cloud with a developing tail cloud. Finally, back in Murdo, we got west and right under the storm, just as the wall cloud totally wound up and produced a funnel about 2/3 of the way to the ground, and possibly the longest tail cloud I've seen. If it had dropped a tornado, we would have been about 1/2 a mile from it as it came towards us! The wall cloud then crossed over us and I-90, and we chased it north of Murdo until the storm seemed to lose focus and we ran out of roads. Upon further review, two of the guests have pictures from when we were moving after the funnel passed over us that seem to indicate that the funnel did indeed reach the ground. 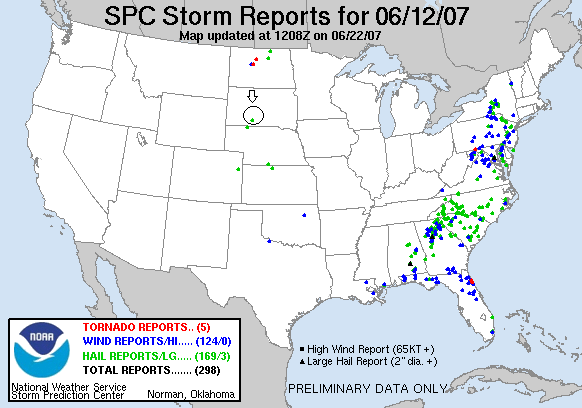 Can't really confirm or deny whether it was a brief tornado, but I didn't see it so it wouldn't count for me anyway. We then headed north all the way back to Pierre (mileage was 203 for the day as we passed the hotel where we had started) and left the line of storms two our west to try and punch out of an extension of the line segment to our east. We ended up almost in a hurricane-eye like area, with towers arcing from our west all the way around to our north then our east. It was pretty cool in the hole, with an eerie long roll cloud off to the north as we punched east, and strong winds continuously changing directions as we went through. Punching out in front, we decided the whole thing had lined out and tried to get run over by an oncoming hail core, but the storms were rapidly turning into nothing more than large rainstorms. We decided to call it a day and headed down to our stop for the evening, North Platte, NE, after stopping at the Bunkhouse in Valentine for some wall-eye. South of Pierre, SD. This day turned out better than I expected as there was a swarm of storms since there was no cap to prevent them from forming. 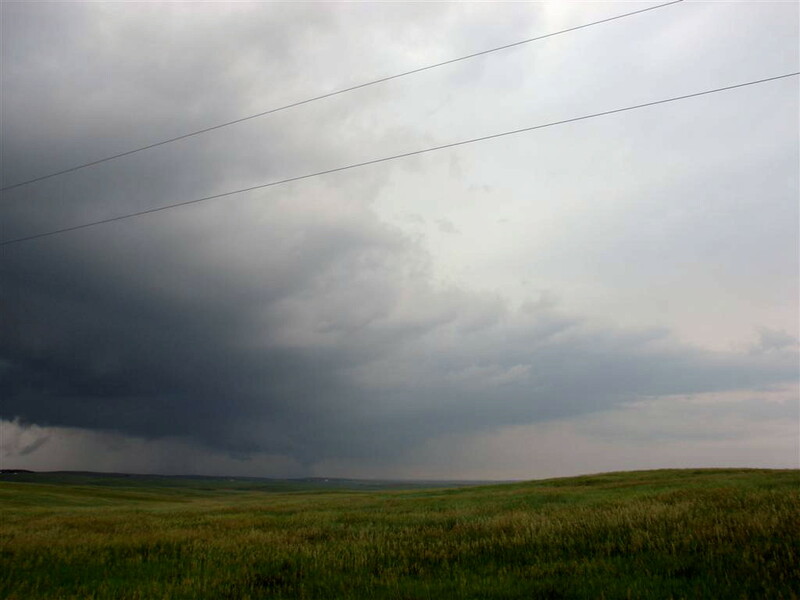 Here we are west of White City, SD as a wall cloud develops on a storm. 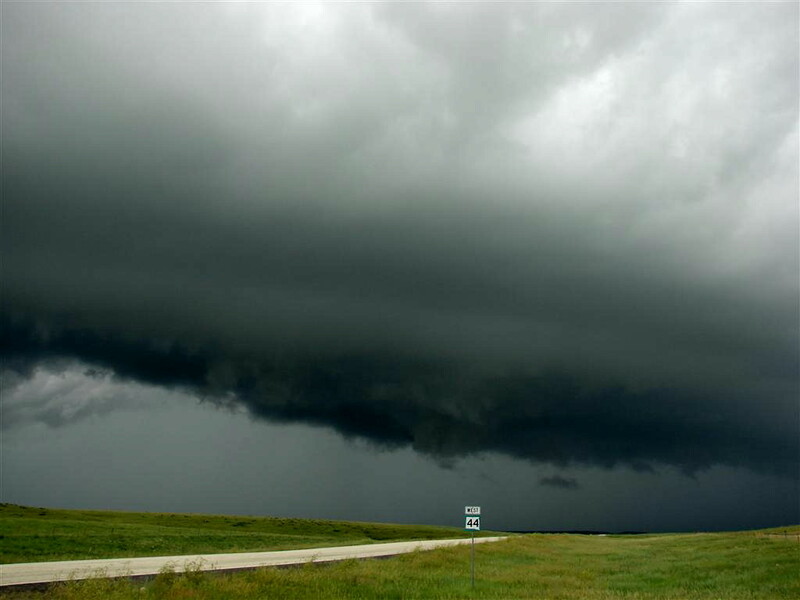 This storm exibited classic supercell structure and was strongly rotating. After the first cell went by we waited while Roger zoomed off to try and collect some big hail. As the second cell moved past us, it really got it's act together. 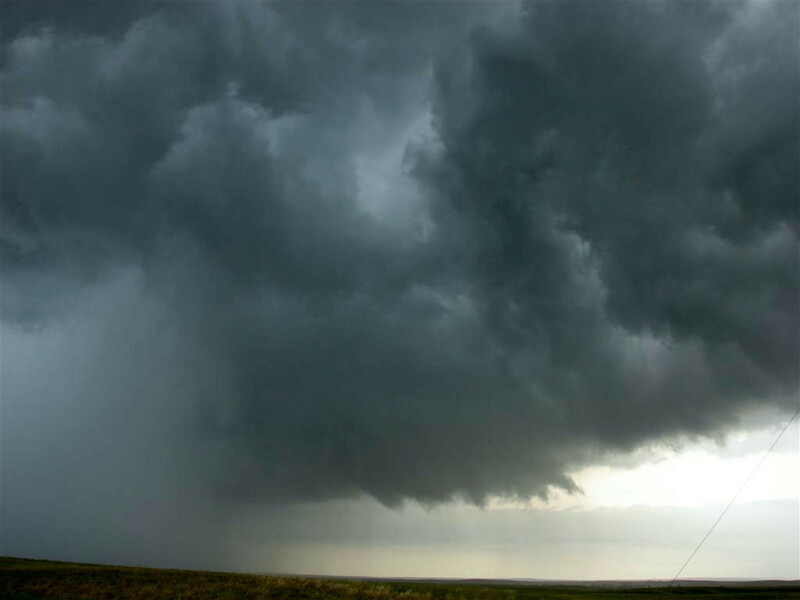 Here a violently rotating lowering extends out in front of the rain core. Everything was HP this day. 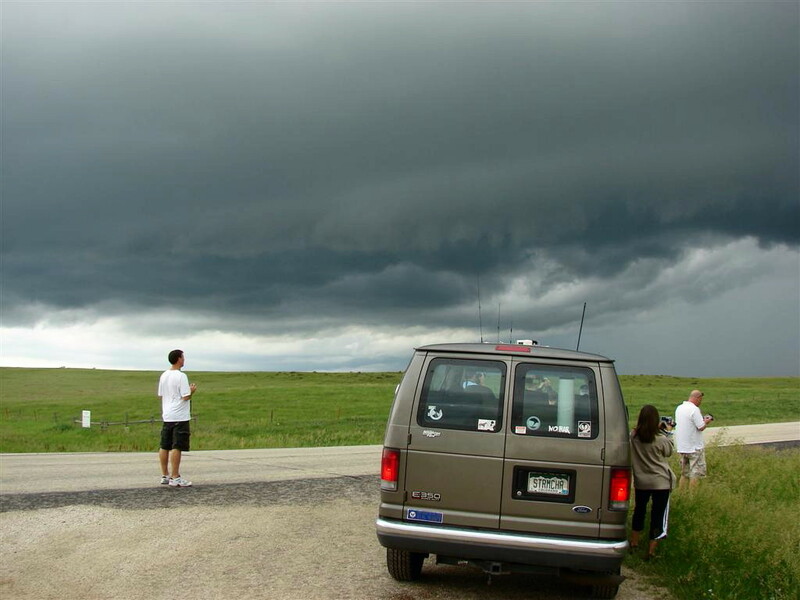 The group watches the ominous lowering now due south of us. Asking a farmer whether the dirt road in the picture was passable, he informed us that it was a swamp not far down, so we bolted back to Rte. 83 and all the way back to the highway. Luckily, the storm cycled while we were in transit. Now back ahead of the storm right along I-90, the storm wraps up and tries to tornado right in front of us! The wall cloud gets undercut and becomes raggedy as it passes almost right overhead. We ran out of road in Murdo, SD. The storm still has a decent lowering as it heads off to the north, but it never did anything.